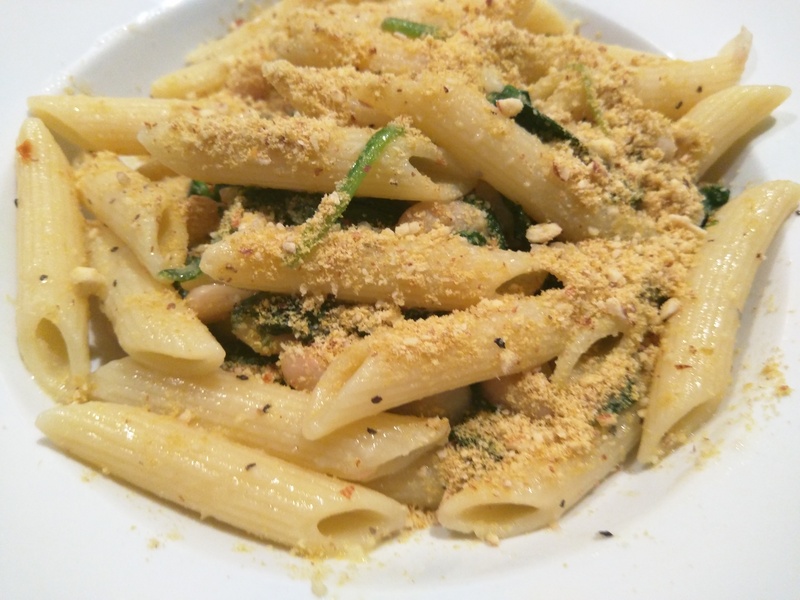 To make the “Parmesan” cheese, I pulsed the almonds and nutritional yeast in a blender until the almonds turned into a powder. Be careful not to over-blend, as the oils from the almonds can release and start to create almond butter if pulsed for too long. I reserved the cheese in a bowl for later. In a large pot, I boiled the pasta in salted water until cooked, and then drained it. The pasta was rinsed with cold water to stop it from cooking more. In another pot, I heated 2 tbsp olive oil on medium heat and sauteed the garlic for 30 seconds. I added the spinach in large handfuls, letting it reduce when the pot became full. Once all the spinach was added and reduced, I added the beans and 1/4 cup of the broth. I let the mixture boil for a few minutes, until the liquid reduced by half. I added the rest of the broth, the red pepper flakes, and 1 tsp salt. The pot was removed from the heat at this point. I tossed the pasta with the sauce, along with the last 1 tbsp olive oil. I added all the lemon juice and seasoned the pasta with salt and pepper. The pasta may need up to an extra 1/2 cup of liquid if it is too dry, but mine did not. I served the pasta with a generous helping of the “Parmesan” cheese on top, and ate it with a kale salad with vegan Caesar salad dressing, made by my beau. We each had seconds of the pasta and agreed that it was a great comfort food.